Hay fever is an allergic reaction to pollen, not just from grass but also from any other plants, including trees. Some people can also be allergic to the spores from moulds. It can make the summer miserable for some people, but there are ways to make life with hay fever a little bit easier. The symptoms of hay fever include a runny nose and sneezing, itching, red and watering eyes, feelings of tightness or dryness in the throat and chest, itching in the ears and the roof of the mouth, tiredness and problems concentrating. Histamine is a chemical produced naturally by the body as part of the allergic reaction, and it causes sneezing, itching, runny noses and watery eyes. Antihistamines block the production of histamine. Oral antihistamines are systemic – they are absorbed into the blood stream and travel around the whole of the body – so these work well for people who have more than one symptom, such as itchy eyes, a runny nose and a dry throat. Some antihistamine tablets can cause sleepiness, so check the back of the packet. Local, or topical, treatments are used just where they are needed, in the eyes or nose, and are useful for people who just have one symptom. These can be corticosteroids or antihistamines. Corticosteroids come in nasal aerosols or sprays, and work by reducing the inflammation (swelling) inside the nose, and so reduce sneezing, runny or blocked noses, and itching. Antihistamines come in nasal sprays and eye drops, and can be used to treat runny noses and sneezing, or itchy eyes. These are also known as allergy shots or subcutaneous immunotherapy (SIT), and are injections of tiny amounts of pollen or mould spores just under the skin. These allow the immune system to develop a tolerance to (get used to) the allergic substances. The treatment can take two or three years and immunotherapy injections need to be given daily or weekly to start with – the injections then get gradually further apart. The effect can last for a number of years, so could be worth it for people with really bad hay fever symptoms. 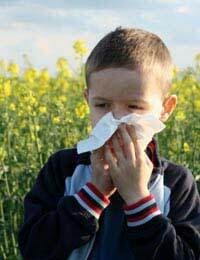 Many people with hay fever also develop asthma – giving children immunotherapy might stop asthma symptoms developing. Immunotherapy for hay fever is also available as a tablet that melts under the tongue (sublingual immunotherapy or SLIT) – this has to be taken every day for a number of years. As well as using systemic and local drug treatments and injections, there are other things that can help. Avoid going out on high pollen count days if possible. Avoid areas where there are large amounts of pollen, such as large areas of grass. Wearing sunglasses, especially the wrap around kind, keeps pollen out of the eyes. Regularly changing bed linen can help reduce the pollen levels in the bedroom. After being outside, showering and changing will get rid of any pollen carried in on the clothes and hair. Keeping the windows shut will stop pollen blowing in – closing the curtains and using fans can keep the rooms cooler on a hot day (keeping car windows shut can help as well – look out for cars with air vents with pollen filters). Dusting using a damp cloth and vacuuming (preferably with a vacuum cleaner with a pollen filter) will keep the house pollen levels down. Give up smoking and ask people around you not to smoke – the second-hand smoke can irritate the membranes in the nose, mouth, throat and eyes.